Republican Roy Blunt won a second term in the U.S. Senate with a larger than expected win over Democratic challenger Jason Kander Tuesday. The crowd gathered at his election watching party at the Ramada Plaza Hotel and Oasis Convention Center in Springfield was giddy soon after it became apparent Donald Trump was closing in on the office of president. While Kander tried to portray Blunt as a Washington insider connected to special interests and lobbyists, Blunt successfully framed Kander as a rubber stamp for Clinton and President Obama. Senate Republicans announced Blunt as the 51st GOP member early Wednesday morning, ensuring the party holds control of the chamber. It appeared that once the crowd at Blunt’s election watch party had sensed Trump had secured the White House and knew Blunt’s victory was official, it began to dissipate. The Senator’s gathering was clearly the anchor spot for other Republican candidates in the region. Missouri Lieutenant Governor elect Mike Parson spoke on stage and mingled with the crowd. 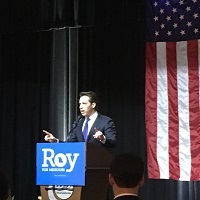 Attorney General elect Josh Hawley, a constitutional law professor at the University of Missouri who held his own election watch party in Springfield, introduced Blunt after they both entered the building at around midnight. U.S. Congressman Billy Long, whose 7th District encompasses Springfield, also appeared at the Blunt gathering. Long won his race by a dominant 68 percent. He was very boisterous about Trump’s victory. Long has been highly critical of other Republicans, including House Speaker Paul Ryan, who either declined to support the now President elect, or didn’t enthusiastically back him. Blunt’s reelection comes as Missouri’s five other statewide races were also won by Republicans.